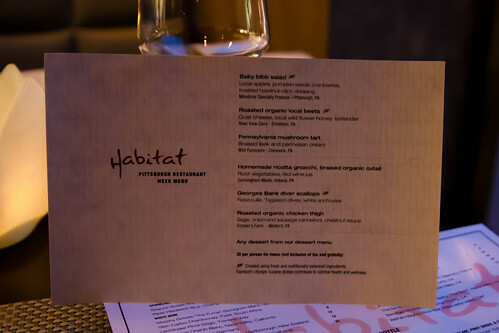 My second Pittsburgh Restaurant Week adventure took Señorita Cibulka and I to Habitat inside the Fairmont Hotel downtown, a first visit there for both of us. 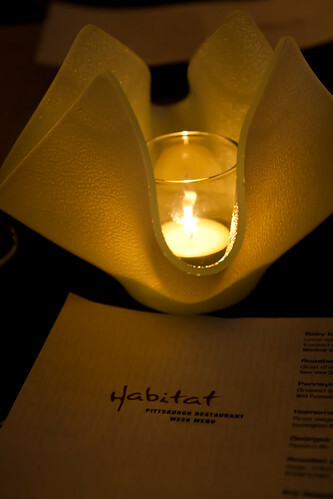 I was particularly excited to try Habitat as their Pittsburgh Restaurant Week special sounded absolutely fabulous! 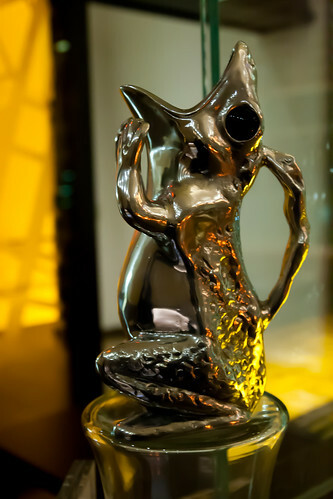 Even the water pitcher is cool! But what of the food? As I said, I was drawn by the Pittsburgh Restaurant Week three-course special for $30. There were three fabulous-sounding options each for the first and the second courses, and for the dessert, anything from their regular dessert menu was game. 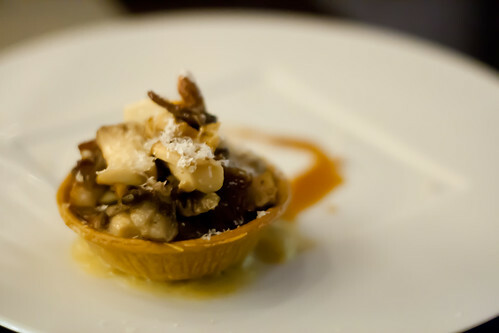 For my first course, I waffled between the Baby Bibb Salad (with local apples, pumpkin seeds, dried cranberries, and toasted hazelnut-dijon dressing) and the Pennsylvania Mushroom Tart (with braised leek and parmesan cream). In the end, I went with what I thought would be the healthier option: the salad. It was good, and the dressing had a strong flavor. There was probably a bit too much of the dressing left in the end as my last few bites of the salad were too vinegary, but overall I enjoyed the salad. Breaking my own rule, I took a photo of SC's mushroom tart even though I didn't taste it, but it just looked so good! I'm sure she'll be telling the world all about this soon in her blog. 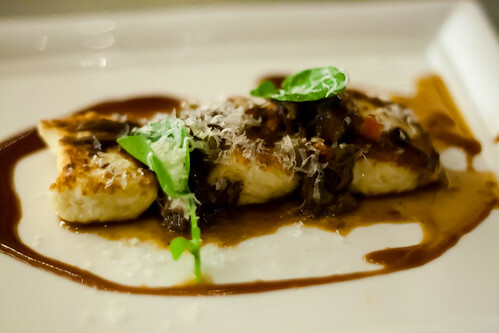 For our second course, both SC and I chose the Homemade Ricotta Gnocchi with Braised Organic Oxtail. This was absolutely amazing! The consistency of the gnocchi was nothing like I expected. They were "fluffy," almost like biting into a cloud or a soft pillow of ricotta goodness. The oxtail and the savory sauce were simply heavenly. The portion doesn't look big, but it is sufficient. 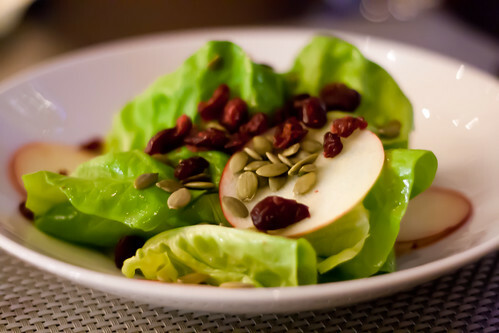 Judging from the regular menu I saw on their website, this is an appetizer item as well. Our attentive waiter, Nate, then presented us with the dessert menu. I thought my appetizer choice was tough, but it was even tougher to pick just one dessert! The Pumpkin Pudding made it to my short list, and the Warm Gingerbread sounded good too, but when Nate mentioned that Chocolate Oreo Torte has cream with fresh mint whipped into it and cocoa nibs sprinkled on top, both SC and I were sold! I had thought the gnocchi was hard to top, but the Chocolate Oreo Torte really stole the show tonight. 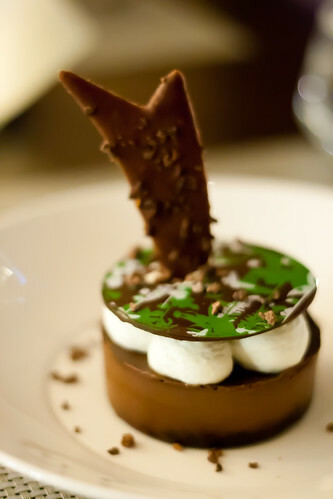 The chocolate filling was rich and decadent, and the fresh mint whipped cream was oh so deliciously fresh! I kept trying to come up with something I could make at home that could be topped with mint whipped cream. I really need to try making this whipped cream myself sometime! Though I had not-so-secretly hoped that I would have room for two desserts (that Pumpkin Pudding just sounded so amazing! ), I was quite full after the Chocolate Oreo Torte. Oh well, maybe next time. 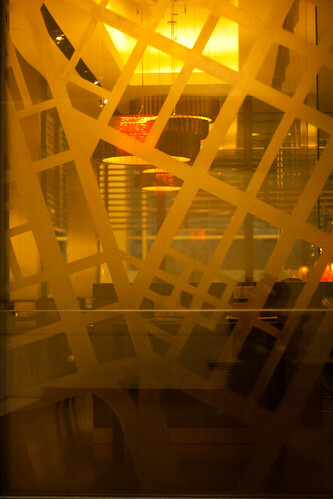 Nate informed us that the menu would remain the same until March. 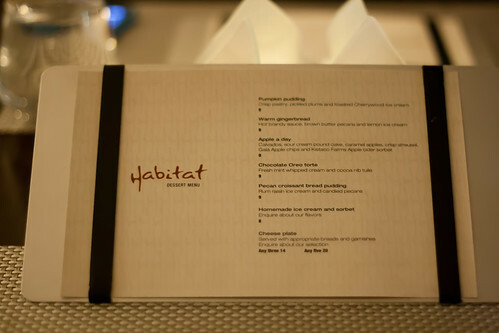 The service at Habitat, from the host to the server, was excellent, much as what one would expect at a fine dining establishment inside an upscale hotel. 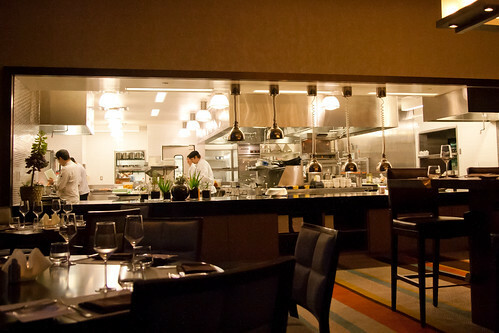 Jerry, the manager, even came by our table to greet us and make sure that everything was to our satisfaction. I am not used to being so pampered and certainly never demand this kind of attention, but it was sure nice to be treated like I'm some VIP. Habitat truly exceeded my expectations in every way, and I'm so glad I made it there tonight.